It is no longer necessary to waste time adjusting your product catalog since the Mass Product Actions extension by Amasty provides the ability to perform lots of monotonous tasks in bulk in just a couple of clicks. Thus, you can easily change prices and use different parameters to make your work more precise; utilize attribute sets; edit categories; relate products, and define cross-sell/up-sell parameters in a matter of seconds. Fully customizable interface (only the necessary mass actions are displayed). There are tons of possibilities provided by the module. For instance, you can apply bulk price change on the basis of cost. This helps to increase or decrease price as fast as possible, at the same time, you keep your budget balance. 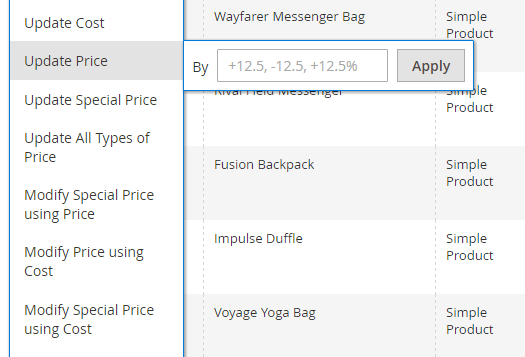 It is also possible to update special prices using the Magento 2 extension’s functions. As for price rounding, the Amasty Mass Product Actions Magento 2 module supports automated price rounding. Specify rules and always turn 3.78 into 4 or 3.99. As a result, all odd looking values are replaced with more professional looking ones. Besides, all the prices from your price list are based on the same standards. Also, note that tier prices and group prices can be adjusted as well. The result is achieved in just a few clicks, and all the changes are applied immediately. multi-way linking – provides the ability to set cross-links between products. 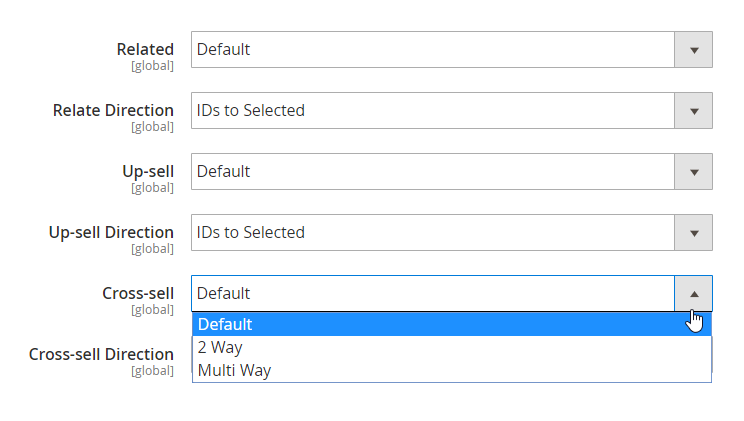 So, with the Amasty Mass Product Actions Magento 2 extension, you will easily copy custom options to any number of products, rapidly spread attribute values to a group of positions, seamlessly change attribute sets, and effortlessly copy images with all related data. Furthermore, some mass actions simplify your interaction with categories. 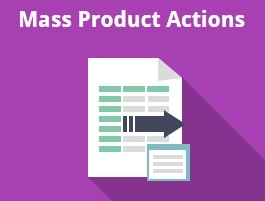 The Amasty Mass Product Actions Magento 2 module allows admin users to assign and replace categories in bulk! Thus, if you want to reduce the time necessary for your daily backend routine, you should pay attention to the Amasty Mass Product Actions Magento 2 module. This extension will essentially improve the way you work with the admin interface of your Magento 2 storefront. Some common tasks will be reduced at all, while the others will consume much less time. 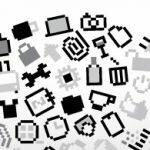 While the benefits of the Amasty Mass Product Actions Magento 2 module are obvious, what are its drawbacks? We couldn’t find any. Of course, it may be a little bit complicated when you try to complete some ordinary tasks for the first time using the new algorithms, but it is only because of the lack of experience. After several hours of working with the module, you will no longer experience nostalgia for the default Magento 2 backend. Amasty Mass Product Actions for Magento 2 was developed with the backend administrators in mind, so it adds only pleasant moments to the daily work. Below, we describe the full list of actions available with the extension. Go to the Catalog page and find the Action drop-down above the products grid. The first three actions are: Delete, Change status, and Update attributes. Click on the ‘Change status’ action to choose between Enable and Disable options. Next, the extension lets you assign, remove, or replace categories. By clicking on each action, you trigger a small window for specifying Category IDs. The window includes the ‘Apply’ button. Another section consists of the following actions: Update Cost, Update Price, Update Special Price, Update All Types of Price, Modify Special Price using Price, Modify Price using Cost, and Modify Special Price using Cost. Each one triggers a small window where you can increase or decrease the price by a certain percentage or a flat amount. Relate, Up-sell, and Cross-sell are other actions you can apply in bulk with the help of the extension. By clicking on each one, you trigger a small window that requires IDs and has the ‘Apply’ button. It is also possible to remove relations, up-sells, and cross-sells in bulk. You only have to choose an algorithm (Remove relations between selected products only, Remove selected products from all relations in the catalog, or Remove all relations from selected products). Next, you can copy relations, up-sells, and cross-sells. Click on a necessary option and specify from where to copy them. Then, hit ‘Apply’. As for copying custom options, attributes, and images, you should enter an appropriate product ID from which you’d like to get data. Removing images does not require any additional actions. To change an attribute set for the selected products, specify a product ID you’d like to use in this process. You can also quickly delete products with the help of the ‘Fast Delete’ action. Besides, it is possible to append and replace text in attributes. You just have to specify a new meaning. 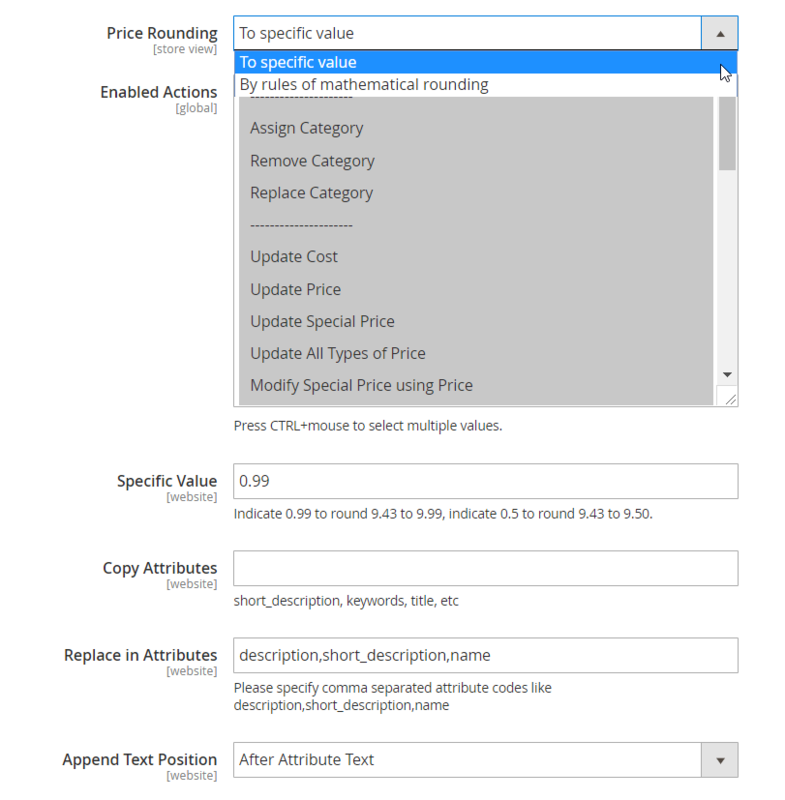 As for general settings of Amasty Mass Product Actions, they let you choose price rounding (To specific value or By rules of mathematical rounding) and enable/disable certain actions. If you select ‘To specific value’ in the first field, it is also necessary to set this specific value (0.99, 0.5, etc.). Other options are: Copy Attributes, Replace in Attributes, and Append Text Position. Next, you can fine-tune product linking algorithms. The section consists of the following options: Related, Relate Direction, Up-sell, Up-sell Direction, Cross-sell, and Cross-sell Direction. Such a wide variety of actions offered by the Mass Product Actions module radically simplifies a daily routine of a Magento administrator. After installing the extension, you will no longer have to focus on an individual approach to products and will be able to spend your time on more important goals. As for the price of Amasty Mass Product Actions for Magento 2 and 1, it is $189 and $139 respectively.